"Jump across the tops of the Teetering Towers. Depending on where you land, the towers tilt in a different direction." "Once the tower teeters over, jump with all you've got. Then you can make it to the next tower." Teetering Towers is a 1-player minigame found in Mario Party. The only way to move tower-to-tower is to tilt the tower into the direction the player desires. Some of the towers have either a coin or a Coin Bag. 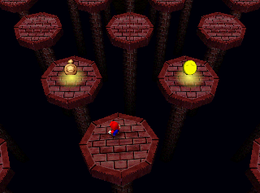 The game is cleared if the player reaches the final platform at the end. If the player falls into the abyss, the game will end in a "Miss!" and they will lose five Coins. This page was last edited on May 6, 2018, at 13:49.